I'm aware the go-to material for quads like revs are the 3/4oz icarex ripstop nylon. But anyone can help with determining the thread count and density of such .75oz ripstop rev sails use? Assuming 1sqm or sqf. Presentation and Kymera sail question. After years enjoying visiting this forum I would like to present myself. 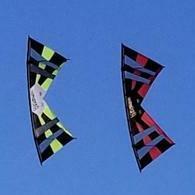 I live in Spain and I fly dual and quad line kites, also the Urban ninja single line. I´m always trying to learn to improve my skills and Kitelife helps me a lot. Recently I have bought a wonderful Kymera kite from kiteparts.net. I have only fly the kite once and I like it a lot .... but I´m not sure about the tension of the sail. I would like to know if is it normal or not that the sail is so loose after the assembly. Here I show some little videos of my kite where you can see the sail after the assembly of the kite following the John Barresi tutorial.